It’s a beautiful day in New Jersey and the temperature promises to get up to 15 degrees Celsius. The official first day of spring is about two weeks away. On the streets here this morning, I met a guy wearing a sweatshirt with ‘Wanganui’ across the back (he was an American) and that felt real good. I got on to a conversation about Michael Laws. 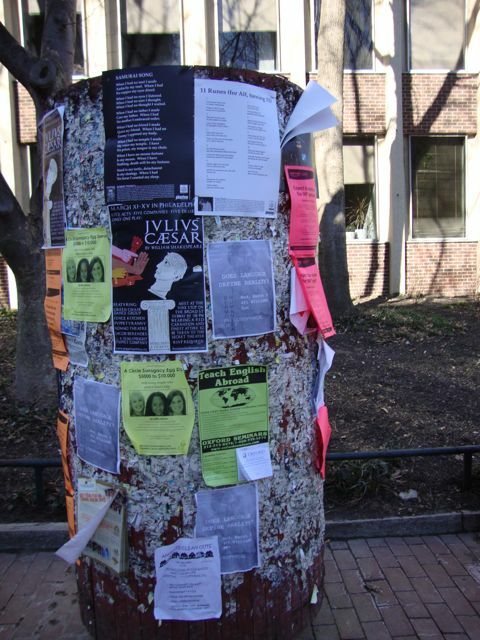 This poster run happened on Saturday afternoon in the area of Philly known as ‘University City’ this is because both the University of Pennsylvania and Drexel University are nearby. The University of Pennsylvania (‘Penn’) was started by Benjamin Franklin in 1750. Benjamin Franklin was quite a guy and one of the founding fathers of the republic. He seems to have been clever at so many things that it is impossible to list them. He started the first public library in America and the first fire department in Philadelphia. He was a newspaperman and a scientist. He experimented with electricity, lightning and kites. He invented bifocals and he said many clever and witty things. I was carrying poem posters by Joe Treceno, Sam Hunt, Robert Pinsky, Jay Clarkson and Brian Turner. There are various bollards around the university and I postered them and then moved on to lamp-posts. All in good fun. On one lamp-post I was accosted by a crazy man. When a government closes mental hospitals and farms people off to small rooms and whatever ‘care’ is called these days… Then people suffer. This is further complicated by a strange health care system that seems to lock out the people who need it most. But, never mind, the man ripped down a NZ poetry poster and told me that we should look after our ‘aborigines’ better. I am going to do another poster run in Philly this Thursday. This time, I’ll be putting up Tusiata Avia posters (“Nafanua, the Samoan war goddess, talks about her friends in Philly”) and Stephen Oliver (“The Great Repression”). These two fine poets feature in the next round of Phantom Billstickers NZ poetry posters (launch is in April in Auckland) and this is kind of like releasing a single off the album. Should be fun.